You may have heard in the news recently that Getty images have made their images freely embeddable on any website. If you haven’t tried them out yet, you’re not missing much. I’m not a big fan of this move, as you’ll soon find out. The new embeds strike directly at social sharing. Social sharing? Really? I didn’t know that “social” extended only as far as Twitter and Tumblr. Have you ever heard of Pinterest, Google+, or Facebook? Image sharing on those platforms is just as important (if not more) than Twitter – so why the favoritism? I don’t get it. What about the embed design? I personally think they are awful. Leave it to Getty to plaster their logo on every embed. Is your website fully responsive with your images fitting their containers perfectly? Forget that, unless you want to modify the iframe embed code and style iframes. Don’t even get me started about embedding an iframe. Iframes are so 2003. What about WordPress users? Forget using Getty images as your featured image in WordPress. Since you don’t have the physical image asset, you can’t upload it as your featured image. Also, what about the sites out there that have a smaller version of the image linked to the larger version. This is for convenience of users who want to click on an image and see a larger version at full resolution. Not anymore! Your Getty image will now link back to the Getty page with all the details to purchase the image. Nevertheless, I’ll quickly walk you through how to embed Getty images for free. 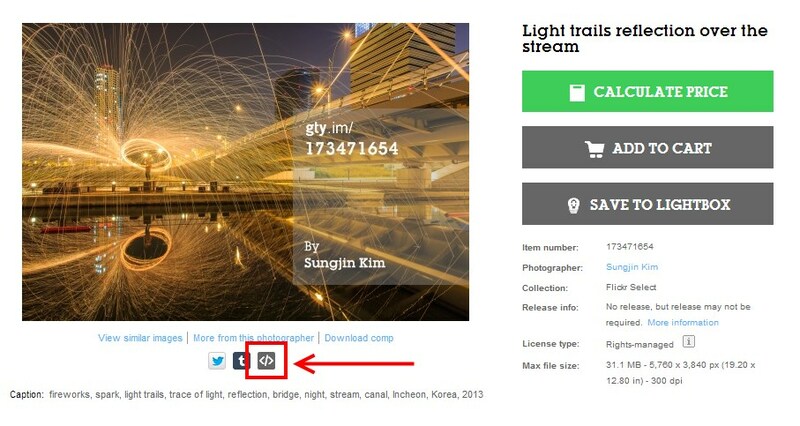 First – find the image you want to embed on Getty’s website. On the images page, click the tiny </> icon. A popup will be displayed, and all you have to do is copy the embed code. 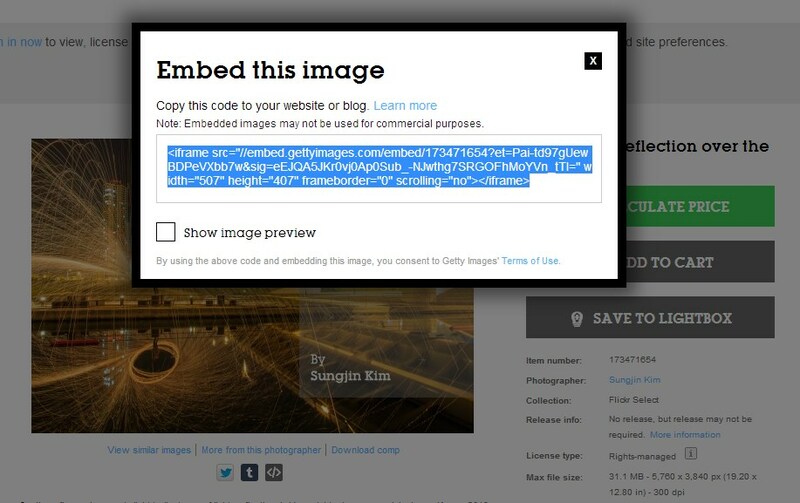 Paste this code where you want the image to display, and boom – your attributed and linked image will show up on your page. I think that many businesses and bloggers out there would be willing to pay fees for high-quality stock images if the price was right. I don’t understand Getty’s Monsanto-like approach to image monetization. There is a way to offer a premium service without making enemies with your existing and potential customers. If Getty was able to allow registered users to link to images stored on Getty servers, Getty would be able to run reports based on their server logs to determine usage from specific domains. Registered users would get their domain approved to ensure that the images would display, and they would only pay for their usage. For the right price, this approach could really work for lots of small businesses and bloggers. Forget Getty, what other options do I have? Instead of using Getty images, I strongly suggest taking a look at the wealth of free, high-quality stock photo resources you have at your disposal. There is a great post at Inbounderish that lists 10 sources, and an even more impressive post at Caddis that lists even more. Check them out! Note: The image used as the “featured” image for this post is not from Getty Images.